As part of the new redesign with the http://www.eiupanthers.com/ athletic website we are dedicated to bringing more new content for coverage of Eastern Illinois Panther athletics. With that said we will add a daily blog (some short, some long) on the happenings in EIU Athletics. Since today is the opening day, we will do two reports. One this morning and one later on this evening. EIU had its first practice of the fall on Saturday night with some crisp weather at the stadium. The practice was a helmets only event as most of the drills consisted of bringing the new players up to speed on how EIU runs a practice. Brandon Large took all of the snaps with the first team offense as he appears set to open the season as the Panthers signal caller. Redshirt sophomore Doug Reynolds recently had shoulder surgery which has ended his 2010 season. Shadonta Travis is the other returning quarterback from the spring and he took the snaps with the second team. EIU opens at Iowa in 27 days. 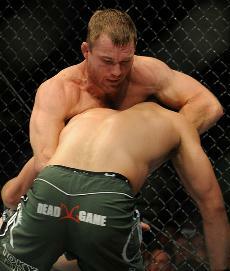 Former EIU wrestler Matt Hughes picked up a victory at UFC 117 last night as he won with a front headlock choke hold over Ricardo Almeida at 3:15 in the first round. Hughes was quoted as saying "It's an old wrestling move I learned at Eastern Illinois" in the post match press conference.